Acropolis of Athens and Erechtheion will appeal to history buffs. Do some cultural sightseeing at Plaka and Acropolis Museum. There's much more to do: explore the world behind art at National Archaeological Museum, explore the ancient world of Theater of Dionysus, contemplate in the serene atmosphere at Temple of Hephaestus, and wander the streets of Monastiraki. To find other places to visit, reviews, and more tourist information, go to the Athens day trip site . Melbourne, Australia to Athens is an approximately 23-hour flight. Due to the time zone difference, you'll gain 8 hours traveling from Melbourne to Athens. In April, daily temperatures in Athens can reach 24°C, while at night they dip to 15°C. Finish your sightseeing early on the 18th (Thu) to allow enough time to travel to Chania Town. You'll explore the less-touristy side of things at Elafonissi Beach and Sirikari Gorge - Polyrrinia Trail. Do some cultural sightseeing at Rethymnon Old Town and The Monastery Arsaniou. You'll find plenty of places to visit near Chania Town: Kissamos (Balos Lagoon & Sklopa), Agios Georgios Byzantine Church (in Anidri) and Venetian Wells (in Gavalochori). There's lots more to do: explore the ancient world of Archaeological Site of Azoires, learn about winemaking at Anoskeli Winery, take in the spiritual surroundings of Agia Irini Convent, and explore the different monuments and memorials at Souda Bay War Cemetery. To see where to stay, more things to do, traveler tips, and tourist information, go to the Chania Town trip itinerary planner. Fly from Athens to Chania Town in 3.5 hours. Alternatively, you can do a combination of flight and shuttle; or ride a ferry. In April, plan for daily highs up to 24°C, and evening lows to 14°C. Wrap up your sightseeing on the 23rd (Tue) early enough to travel to Rhodes Town. 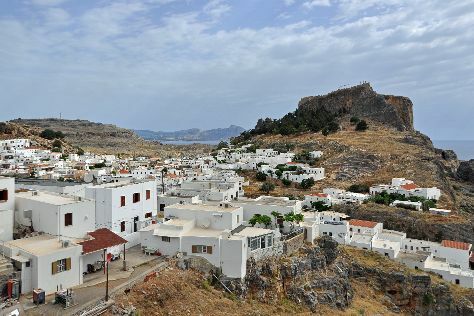 Get a sense of the local culture at Village of Lindos and Kounaki Wines. Get some historical perspective at Acropolis of Lindos and Dormition of Theotokos Church. Change things up with these side-trips from Rhodes Town: Ebonas Winecellar (in Embonas), Church of St. Panteleimon (in Siana) and Archanggelos Michail Thari Monastery (in Laerma). And it doesn't end there: Head underground at Cave of Fourni, take in the architecture and atmosphere at Profiti Elias Monastery, contemplate in the serene atmosphere at Agios Nikolaos Fountoukli, and step into the grandiose world of Palace of the Grand Master of the Knights of Rhodes. To find ratings, traveler tips, and other tourist information, use the Rhodes Town itinerary planner . Traveling by combination of shuttle and flight from Chania Town to Rhodes Town takes 4.5 hours. Alternatively, you can fly; or do a combination of car and ferry. April in Rhodes Town sees daily highs of 24°C and lows of 17°C at night. Cap off your sightseeing on the 28th (Sun) early enough to travel to Matera. St. Peter's Basilica and Catacombe di San Callisto will appeal to history buffs. Satisfy your inner culture vulture at Colosseum and Piazza Navona. Change things up with these side-trips from Rome: Parco Archeologico di Ostia Antica (in Ostia Antica), Duomo di Orvieto (in Orvieto) and Civita di Bagnoregio (in Civita di Bagnoregio). There's lots more to do: contemplate the long history of Palatine Hill, explore the world behind art at Vatican Museums, take in the architecture and atmosphere at Church of St. Louis of the French, and ponder the design of Trevi Fountain. To see maps, other places to visit, ratings, and more tourist information, use the Rome trip planner . You can fly from Rhodes Town to Rome in 6 hours. Alternatively, you can do a combination of ferry and car; or do a combination of ferry and bus. The time zone difference moving from Eastern European Time to Central European Time is minus 1 hour. Plan for little chillier nights when traveling from Rhodes Town in April since evenings lows in Rome dip to 11°C. Wrap up your sightseeing on the 4th (Sat) early enough to take a train to Florence. 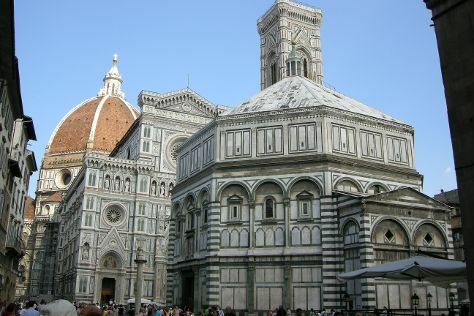 Popular historic sites such as Cathedral of Santa Maria del Fiore and Piazza del Duomo are in your itinerary. Discover out-of-the-way places like Piazza della Signoria and Borgo di Lucignano d’Arbia. Get out of town with these interesting Florence side-trips: Barberino Val d'Elsa (in Barberino Val d'Elsa), Castello San Donato in Perano (in Radda in Chianti) and Abbazia di San Galgano (in Chiusdino). Dedicate the 6th (Mon) to wine at some of the top wineries in the area. Next up on the itinerary: admire the masterpieces at Uffizi Galleries, steep yourself in history at Historic Centre of San Gimignano, pause for some serene contemplation at Basilica - Santuario di Santo Stefano, and get engrossed in the history at Basilica di Santa Croce. To find more things to do, traveler tips, photos, and tourist information, read our Florence day trip planning tool . Take a train from Rome to Florence in 2 hours. Alternatively, you can drive; or fly. Traveling from Rome in May, plan for slightly colder nights in Florence, with lows around 13°C. Finish your sightseeing early on the 10th (Fri) to allow enough time to take a train to Venice. 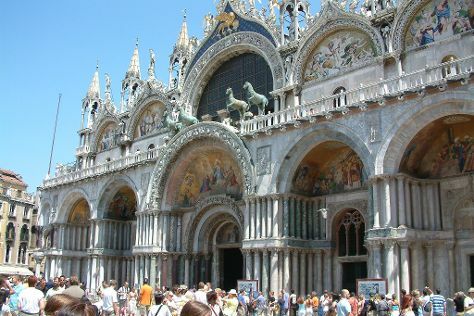 Doge's Palace and Basilica di San Marco are good opportunities to explore the local culture. Escape the urban bustle at Canal Grande and Laguna Veneta. There's much more to do: get to know the fascinating history of St. Mark's Square, take a stroll through Campo del Ghetto, don't miss a visit to Peggy Guggenheim Collection, and contemplate the long history of Centro Storico di Venezia. To find traveler tips, reviews, photos, and tourist information, you can read our Venice online journey planner . Traveling by train from Florence to Venice takes 2.5 hours. Alternatively, you can drive; or take a bus. In May, daily temperatures in Venice can reach 26°C, while at night they dip to 15°C. Finish your sightseeing early on the 14th (Tue) so you can travel to Barcelona. Take a break from the city and head to Bufadors de Bevi and Mirador del area recreativa de Xenacs. Explore hidden gems such as La Via del Nicolau and Font de l’Adou. 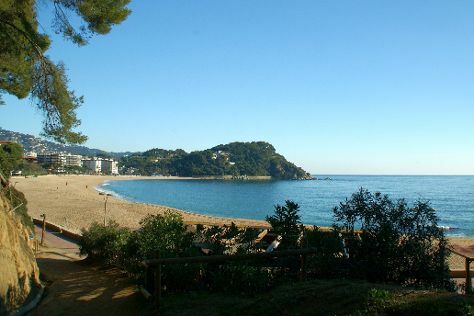 Change things up with these side-trips from Barcelona: Fenals Beach (in Lloret de Mar), La Fageda d'en Jorda (in Olot) and Les Roques Encantades (in Susqueda). There's still lots to do: trek along Via Ferrata Cala del Moli, explore the landscape on two wheels at Eitzinger Sports Bike Rent and Tours and Shop, ride a horse along Centre Hipic Bonastre, and head outdoors with X-wave cambrils FlyBoard. For ratings, photos, where to stay, and more tourist information, read Barcelona driving holiday planner. Traveling by flight from Venice to Barcelona takes 5.5 hours. Alternatively, you can do a combination of train and flight; or drive. May in Barcelona sees daily highs of 25°C and lows of 16°C at night. Finish your sightseeing early on the 19th (Sun) so you can travel to Palma de Mallorca. You'll explore the less-touristy side of things at Alcudia Old Town and Castell d Alaro. Get a sense of the local culture at Catedral de Mallorca and Bodega Son Artigues. Get out of town with these interesting Palma de Mallorca side-trips: Basilica de la Mare de Deu de LLuc (in Lluc), Santuari de Cura (in Algaida) and Port de Pollenca Beach (in Port de Pollenca). There's lots more to do: learn about winemaking at SON PRIM Bodega, steep yourself in history at Llotja, step into the grandiose world of Bellver Castle, and take in the architecture and atmosphere at Basilica de Sant Francesc. To find maps, other places to visit, ratings, and more tourist information, read Palma de Mallorca trip maker tool . You can fly from Barcelona to Palma de Mallorca in 2.5 hours. Alternatively, you can ride a ferry; or do a combination of ferry and bus. Expect a daytime high around 27°C in May, and nighttime lows around 14°C. Finish your sightseeing early on the 24th (Fri) so you can travel to Maspalomas. Do some cultural sightseeing at Basilica de la Virgen del Pino and Templo Ecumenico de San Salvador. Get outdoors at Playa de Maspalomas and Anfi Tauro Golf. When in Maspalomas, make a side trip to see Las Canteras Beach in Las Palmas de Gran Canaria, approximately 46 minutes away. There's still lots to do: take a tour by water with Boat Tours & Water Sports, kick back and relax at Playa de San Agustin, and appreciate the extensive heritage of Paseo Costa Canaria. 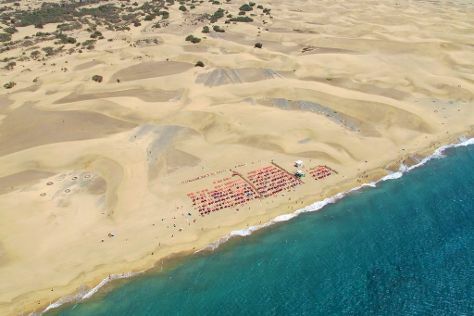 To find ratings and more tourist information, you can read our Maspalomas trip planner . You can fly from Palma de Mallorca to Maspalomas in 5 hours. Another option is to do a combination of ferry and car. The time zone difference when traveling from Palma de Mallorca to Maspalomas is minus 1 hour. Expect a bit warmer evenings in Maspalomas when traveling from Palma de Mallorca in May, with lows around 20°C. 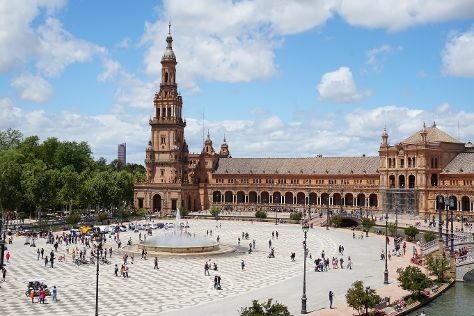 Wrap up your sightseeing on the 27th (Mon) to allow time to travel to Seville. On the 28th (Tue), contemplate the long history of Plaza de Toros de la Maestranza, then delve into the distant past at Archaeological Ensemble of Italica, and then make a trip to Plaza de España. On the next day, explore the galleries of Royal Alcázar of Seville, take a stroll through Barrio Santa Cruz, and then get great views at Catedral de Sevilla. To see ratings, traveler tips, and other tourist information, go to the Seville travel site . You can fly from Maspalomas to Seville in 5 hours. Other options are to do a combination of flight and train; or do a combination of ferry and car. You'll lose 1 hour traveling from Maspalomas to Seville due to the time zone difference. Expect slightly colder evenings in Seville when traveling from Maspalomas in May, with lows around 17°C. Wrap up your sightseeing on the 29th (Wed) early enough to travel to Paris. Get some cultural insight at Palace of Versailles and Louvre Museum. 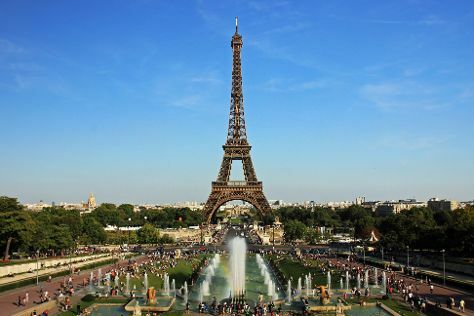 Visit Eiffel Tower and Arc de Triomphe for their historical value. You'll find plenty of places to visit near Paris: Chartres Cathedral (in Chartres) and Chateau de Fontainebleau (in Fontainebleau). There's lots more to do: admire the striking features of Cathédrale Notre-Dame de Paris, step off the mainland to explore Ile Saint-Louis, steep yourself in history at Basilique du Sacre-Coeur de Montmartre, and take a stroll through Montmartre. To find maps, more things to do, where to stay, and other tourist information, use the Paris travel route planning site . Getting from Seville to Paris by flight takes about 5.5 hours. Other options: do a combination of flight and shuttle; or drive. Expect a bit cooler temperatures when traveling from Seville in May; daily highs in Paris reach 20°C and lows reach 11°C. On the 4th (Tue), wrap the sightseeing up by early afternoon so you can travel back home.